Maria is an inclusive place and urban renewal strategist, and the Founding Director of Living Space Project, a place making and green space think tank and consultancy. She has over twenty-five years of hands on and strategic expertise in national and international organisations with a major place, heritage, environment and grant making focus. And, has been an advisor for several funding programmes, amongst others, the Big Lottery Fund, NESTA, Artists Project Earth and Natural England. Maria’s current public appointment roles include a board member of the Environment Agency, the Chair of the Heritage Lottery Fund’s South East Committee, and a Commissioner on the Mayor of London’s Sustainable Development Commission. She’s also a former commissioner of English Heritage. 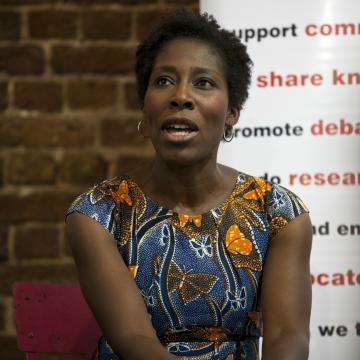 She holds a first degree in Organisational Studies and Business Law from the University of Lancaster, a Masters in International Law from SOAS, University of London, and is a recipient of a Clore Social Leadership Fellowship. Maria’s the author of the book ‘The Place Making factor’ based on her research and experience of using place led thinking as a disruptor of siloed grant making and philanthropy.